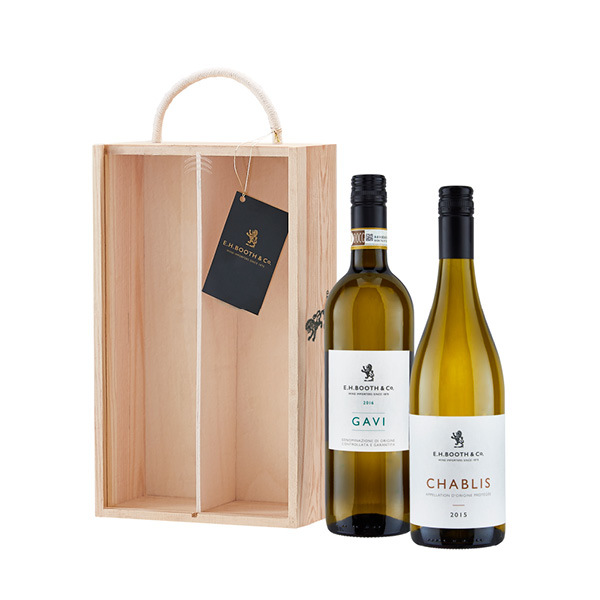 Two fantastic bottles of Booths own label white wine, beautifully presented in a branded double wooden gift box featuring a clear sliding lid and rope handle. So whether you’re looking to surprise a friend, family, loved ones, clients, colleagues, teammates or bosses – from rewards to thank yous, events to celebrations. Our beautiful gifts will certainly go down a treat! Booths Chablis – Made with specially selected Chardonnay grapes for a full flavour, our Chablis has the dry, fresh character that results from cool growing conditions in the most northerly wine region in Burgundy. The aroma is flinty, and the flavours are soft, rich and fruity with plenty of minerality and a juicy bite. The finish is refreshingly crisp. Try it with shellfish, simply cooked fish or buttery roast chicken. Booths Gavi – Cortese grapes are a speciality of Piedmont, in North West Italy, and our zesty Gavi starts life in the vineyards and rolling hills. The delicate grapes produce a medium-bodied wine with a subtle but definite minerality and plentiful apple and pear aromas. Vibrant acidity and a touch of spice add character and backbone. Try it as an apéritif or with meaty fish dishes such as seared tuna steaks. Please contact customer services on 0800 221 8086 for further product specific information. Click here to view our bespoke corporate hamper service and available discounts for larger order volumes.